Our school district initiative has been to increase our writing instruction across the school corporation. We are very fortunate to have Smekens Education as part of our professional development and increasing teacher knowledge of instruction. I guess that's a fancy way of saying that it gives us more tools in our tool box so that we are more prepared to teach writing. The Six Traits of Writing has been the first step that I implemented in my kindergarten classroom. Yesterday, Stephany posted a picture of my writing bulletin board. As teachers, we LOVE our bulletin boards. The cool thing about this one is that I add to it throughout the school year. Therefore, I do not have to keep changing it for every season, holiday and other theme my students are working on. Underneath this bulletin board is a magnetic chalkboard. Therefore, I covered the board with fabric and use magnets on the back of what I add to the board. I prefer them being on magnets so that I am able to remove them as I talk about the book. I have even moved the book from one trait to another to show that the same book can have more than one trait. In fact, I show that the same book has all of the traits. Smekens Education and Kristina Smekens has the icons that are seen in the picture above available as a download on her website. They are simple. Our school district has agreed to have all teachers across grade levels use the same icons for consistency. Our school also uses "I do, We do, You do" for instruction. 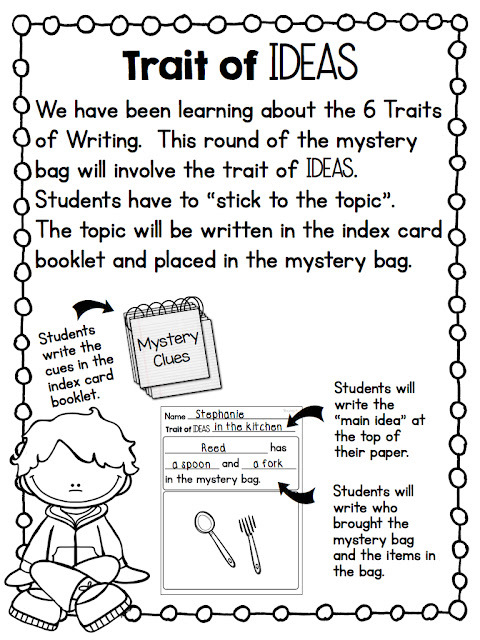 I like to use the mystery bag in my kindergarten classroom. I have always used the mystery bag for several reasons. First, it covers many Indiana and Common Core standards. Many of the speaking and listening standards are covered by using the mystery bag. 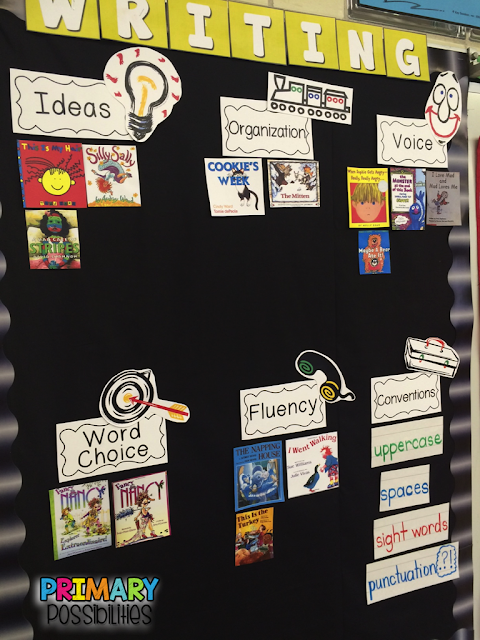 Second, it provides another reading and writing opportunity in my classroom. Next, it allows students to be familiar with writing their classmates' names. Finally, EVERYONE loves to "show and tell". Next week I will begin the fourth round of the mystery bag. We have been learning about the 6 Traits of Writing, specifically focusing on the trait of ideas. Students have to “stick to the topic”. I provide an index card booklet in the bag. 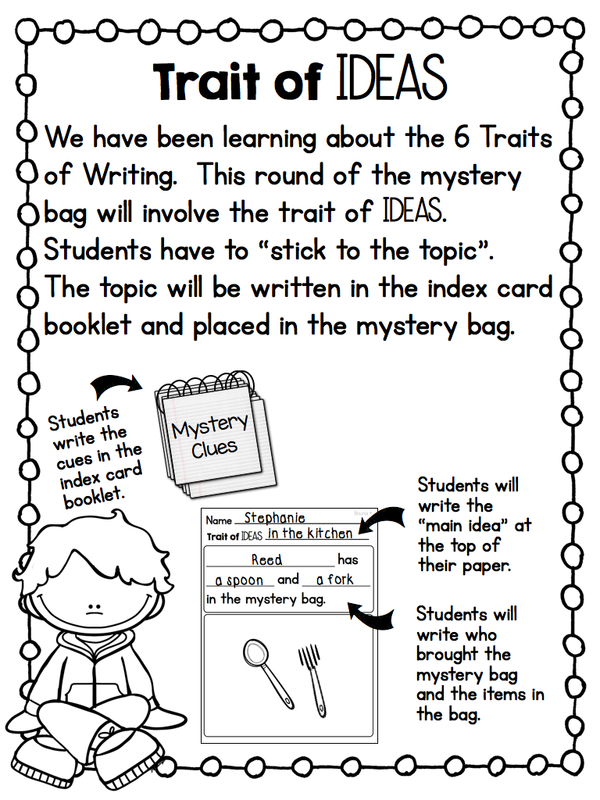 Students write clues in the index card booklet and place in the mystery bag. I know some of you are thinking... What does a mystery bag look like? Well, I use a fabric lunch box similar to the one shown below. This is the letter that I will send home to all parents on Monday. 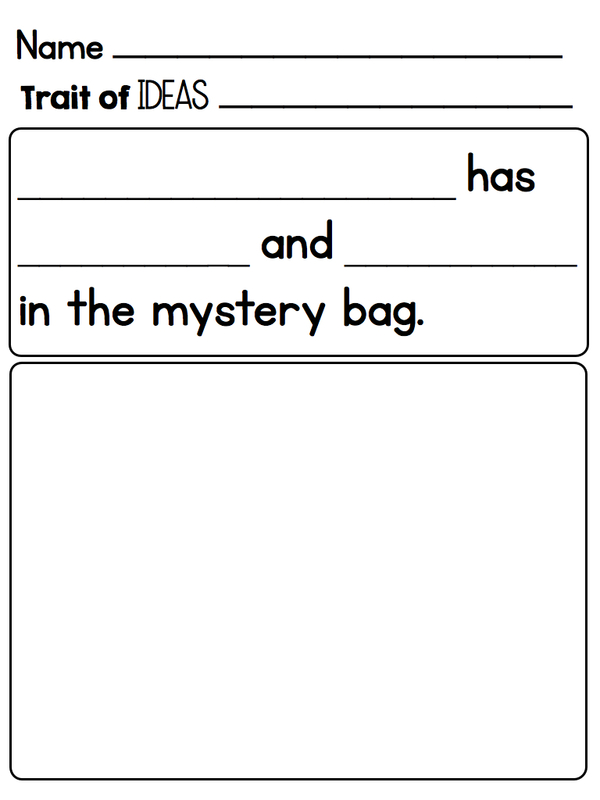 Next, I will start by modeling what I want by putting in two items in the mystery bag. The topic will be "in the kitchen". This is modeling the trait of ideas. As a teacher, I am giving the idea or the topic. (This is the "I do".) Students will be responsible for bringing in two items and writing the clues on the clue card. 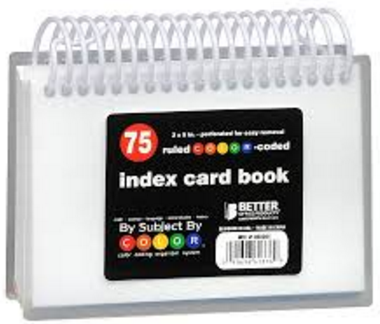 I use an index card booklet, similar to the one shown, for my clue card. I would like to know what you think about teaching the Six Traits of Writing. As I roll out the traits, I will post more about each trait.